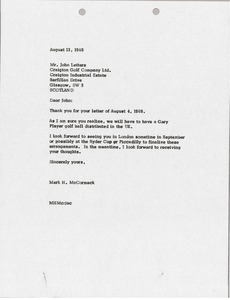 McCormack indicates that they must have a Gary Player golf ball in the United Kingdom and suggests a meeting in England during the Ryder Cup or Piccadilly. 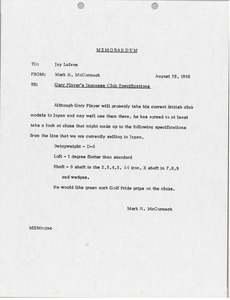 McCormack informs Jay Lafave that Gary Player will probably take his current British club models to Japan and use them there but that he has agreed to take a look other clubs that might be made up to certain specifications listed in the memorandum. McCormack notes that Player would like green cork Golf Pride grips on the clubs. 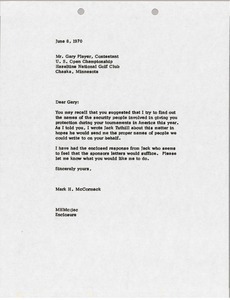 Bob Falkenburg suggested that McCormack write to Rheinhart about Gary Player participating in a golf exhibition match in Sao Paulo or Rio de Janiero while he's playing the Argentine Masters. 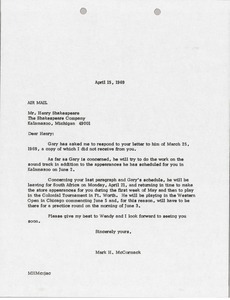 Replying to a letter on Gary Player's behalf. 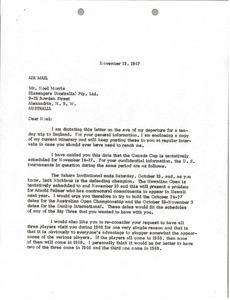 McCormack declines an invitation to participate in a gold tournament in Columbus as Player will be in South Africa at the time. 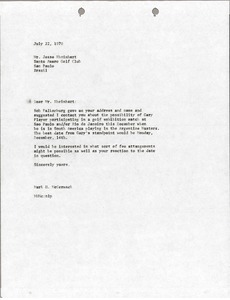 Enclosing a letter from Jack Tuthill regarding obtaining the names of security workers during Player's United States tournaments. 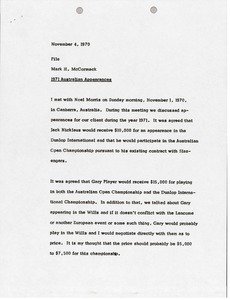 McCormack requests Player's response as to how to proceed. Enclosure not with letter. 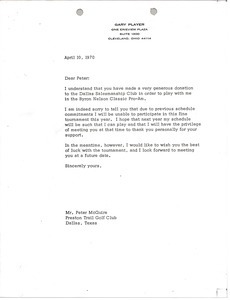 An unsigned letter to Peter McGuire on Gary Player letterhead recognizing his donation to the Dallas Salesmanship Club in order to play with Player in the Byron Nelson Classic Pro-Am. 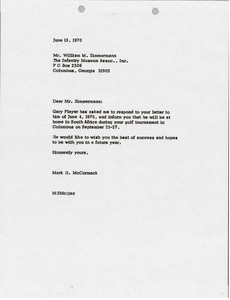 The letter informs McGuire that Player will not be able to participate in the tournament this year due to previous schedule commitments. 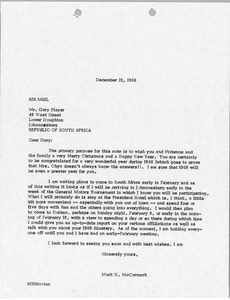 Responding to an early letter on behalf of Gary Player. McCormack indicates that Player will be working on a sound track as well as a appearances in Kalamazoo Michigan. Following this McCormack provides an overview of Player's upcoming schedule.